Share your story as to why YOU chose to be DRUG FREE! America is presently confronted with our worst drug crisis in history. To end the opioid epidemic will require everyone contributing to its solution. With this in mind, we are asking students to share their stories as to why YOU chose to be DRUG FREE. #drugfreeistome is a grassroots effort designed to have students, ages 13 to 18 years, create your own personal video messages about the influences and experiences in your lives that have compelled you to chose to be drug free. It is our hope that these messages may provide inspiration and encouragement to those that are presently dealing with or contemplating drug usage. 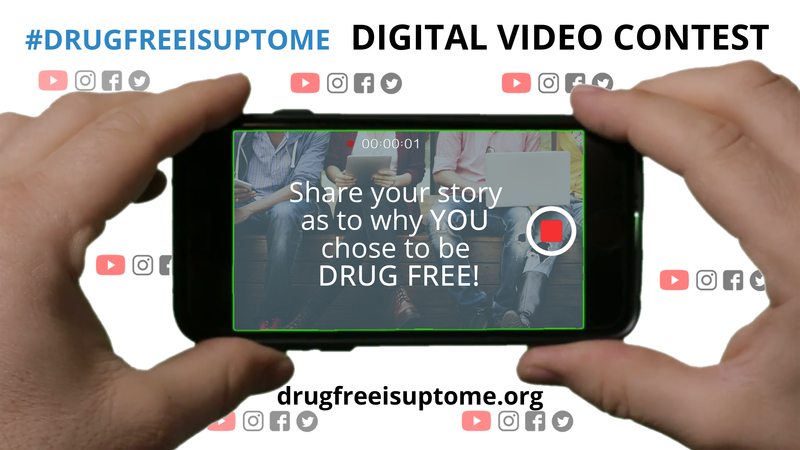 Upload your video here and share your story on instagram, twitter, and facebook using #drugfreeisuptome. Prizes will also be awarded to those videos that receive the highest amount of LIKES and VIEWS. A panel of judges will select three (3) submissions to receive prizes. IMPORTANT: Video message must not exceed 3 minutes in length and must be factual in content. All submissions must be received by 5PM, May 1, 2019. Privacy notice: We will not, in any circumstances, share your personal information with other individuals or organizations without your permission.